At this stage, the participants of the ISICEM and IFAD meetings were asked the final multiple-choice question (MCQ5): “What is your opinion on a positive cumulative fluid balance in septic shock?”. Possible answers were: 1) Peripheral edema may look frightening for the relatives but it is just of cosmetic concern; 2) A cumulative fluid balance is always a biomarker of severity of illness; 3) A positive fluid balance is harmful and an independent predictor for morbidity and mortality; 4) Fluid balance must always be positive initially for a successful resuscitation of shock; or 5) I don't care. Figure 13 shows the results of three votings and it was re-assuring that the majority of participants (49 to 75%) were convinced that a positive cumulative fluid balance is indeed harmful. In fact there is strong evidence to support conservative late fluid management in patients with septic shock, once the initial resuscitation is completed . Hospital mortality was reduced in those patients who received adequate fluid resuscitation initially followed by conservative post resuscitation fluid management (defined as having 2 consecutive negative daily fluid balances within the first 7 days of ICU stay). In a meta-analysis of 47 studies that included 19902 patients, the mean cumulative fluid balance after 1 week was much lower in survivors than non survivors: 2449 ml vs 6983 ml [9, 32]. Fluid Overload; An integrated approach. Patients don’t die from anasarca (extreme edema), they die from multi-organ failure, and different organs need varying amounts of fluids to function. For example, lungs prefer to be dry but the liver cannot function if it is too dry. However when there is clinical evidence of capillary leak with peripheral edema then there will also be end-organ edema resulting in end-organ dysfunction, potentially leading to multiple organ dysfunction syndrome . There are three phases or ‘hits’ a body takes when exposed to an inflammatory insult which includes trauma, infection, burns, sepsis or bleeding and this is summarized in Table 4. Recent evidence showed that the use of PAL treatment, combining PEEP with hypertonic albumin 20% and diuretics to initiate the flow phase (as we did in our patient) decreased EVLWI, IAP and daily and cumulative fluid balance, duration of mechanical ventilation and increased P/F ratio and survival in 57 patients with ALI compared to 57 matched controls . PAL works as follows: the PEEP moves fluids from the alveoli into the interstitium (IS), thereby increasing interstitial hydrostatic pressure and decreasing interstitial oncotic pressure and moving IS fluids towards the capillaries. The hyperoncotic albumin 20% increases the intravascular oncotic pressure thereby removing fluids from the interstitium into the capillaries and finally the frusemide (Lasix®) helps to remove the excess fluids from the patient. In this patient, that developed shock within 18 hours of ICU admission the dynamic evolution is presented. Despite initial normal (and thus adequate) filling pressures, further fluid resuscitation was needed to overcome the ebb phase (this was guided by functional hemodynamic parameters and volumetric preload indices in combination with cardiac ultrasound). Diuretics were initiated after 24 hours to help the patient to transgress to the flow phase because of respiratory failure due to capillary leak as evidenced by increased extravascular lung water. It is interesting to see from the voting that based on barometric preload indicators many physicians were reluctant to start initial fluid resuscitation, this became clear once volumetric monitoring was performed with transpulmonary thermodillution. This case nicely demonstrates the biphasic clinical course from ebb to flow phase during shock as well as the inability of traditional filling pressures to guide us through these different phases. It also provides answers to the four crucial questions that need to be solved in order not to do any harm to the patient. However, one must realize that the above-mentioned thresholds are moving targets but also with moving goals (from early adequate goal directed therapy, over late conservative fluid management towards late goal directed fluid removal). And above all, one must always bear in mind that unnecessary fluid loading may be harmful. If the patient does not need fluids, don’t give them, and remember that the best fluid may be the one that has not been given to the patient…! Finally, it is about time that fluids are considered as drugs, with indications, contra-indications and possible adverse effects . It is essential to give the right fluid at the right time in the right way, and to use the correct monitor correctly. Michard F, Alaya S, Zarka V, Bahloul M, Richard C, Teboul JL: Global end-diastolic volume as an indicator of cardiac preload in patients with septic shock. Chest 2003, 124(5):1900-1908. Michard F, Reuter DA: Assessing cardiac preload or fluid responsiveness? It depends on the question we want to answer. Intensive care medicine 2003, 29(8):1396; author reply 1397. Michard F, Teboul JL: Predicting fluid responsiveness in ICU patients: a critical analysis of the evidence. Chest 2002, 121(6):2000-2008. Malbrain ML, Ameloot K, Gillebert C, Cheatham ML: Cardiopulmonary monitoring in intra-abdominal hypertension. The American surgeon 2011, 77 Suppl 1:S23-30. Cheatham ML, Malbrain ML: Cardiovascular implications of abdominal compartment syndrome. Acta Clin Belg Suppl 2007, 62(1):98-112. Malbrain ML, De Potter TJ, Dits H, Reuter DA: Global and right ventricular end-diastolic volumes correlate better with preload after correction for ejection fraction. Acta anaesthesiologica Scandinavica 2010, 54(5):622-631. Cordemans C, De laet I, Van Regenmortel N, Schoonheydt K, Dits H, Huber W, Malbrain MLNG: Fluid management in critically ill patients: The role of extravascular lung water, abdominal hypertension, capillary leak and fluid balance. Annals Intensive Care 2012, 2(Supplem 1):S1. Malbrain MLNG, Van Regenmortel N: Fluid overload is not only of cosmetic concern (Part I): Exploring a new hypothesis. ICU Management 2012, 12(1):30-33. Malbrain MLNG, Cordemans C, Van Regenmortel N: Fluid overload is not only of cosmetic concern (Part II): Results from a meta-analysis and practical approach. ICU Management 2012, 12(2):34-37. Malbrain ML, Vidts W, Ravyts M, De Laet I, De Waele J: Acute intestinal distress syndrome: the importance of intra-abdominal pressure. Minerva Anestesiol 2008, 74(11):657-673. De laet IE, De Waele JJ, Malbrain MLNG: Fluid resuscitation and intra-abdominal hypertension. In: Yearbook of Intensive Care and Emergency Medicine. Edited by Vincent J-L. Berlin: Springer-Verlag; 2008: 536-548. Malbrain ML, De Laet IE, Willems A, Van Regenmortel N, Schoonheydt K, Dits H: Localised abdominal compartment syndrome: bladder-over-gastric pressure ratio (B/G ratio) as a clue to diagnosis. Acta clinica Belgica 2010, 65(2):98-106. Alsous F, Khamiees M, DeGirolamo A, Amoateng-Adjepong Y, Manthous CA: Negative fluid balance predicts survival in patients with septic shock: a retrospective pilot study. Chest 2000, 117(6):1749-1754. Wiedemann HP, Wheeler AP, Bernard GR, Thompson BT, Hayden D, deBoisblanc B, Connors AF, Jr., Hite RD, Harabin AL: Comparison of two fluid-management strategies in acute lung injury. The New England journal of medicine 2006, 354(24):2564-2575. Malbrain ML, Reuter DA: Hemodynamic treatment algorithms should follow physiology or they fail to improve outcome. Critical care medicine 2012, 40(10):2923-2924. Monnet X, Anguel N, Osman D, Hamzaoui O, Richard C, Teboul JL: Assessing pulmonary permeability by transpulmonary thermodilution allows differentiation of hydrostatic pulmonary edema from ALI/ARDS. Intensive care medicine 2007, 33(3):448-453. Malbrain ML, Cheatham ML, Kirkpatrick A, Sugrue M, Parr M, De Waele J, Balogh Z, Leppaniemi A, Olvera C, Ivatury R et al: Results from the International Conference of Experts on Intra-abdominal Hypertension and Abdominal Compartment Syndrome. I. Definitions. Intensive care medicine 2006, 32(11):1722-1732. Dellinger RP, Levy MM, Carlet JM, Bion J, Parker MM, Jaeschke R, Reinhart K, Angus DC, Brun-Buisson C, Beale R et al: Surviving Sepsis Campaign: international guidelines for management of severe sepsis and septic shock: 2008. Crit Care Med 2008, 36(1):296-327. Dellinger RP, Levy MM, Rhodes A, Annane D, Gerlach H, Opal SM, Sevransky JE, Sprung CL, Douglas IS, Jaeschke R et al: Surviving Sepsis Campaign: International Guidelines for Management of Severe Sepsis and Septic Shock: 2012. Critical care medicine 2013, 41(2):580-637. Malbrain ML, Wilmer A: The polycompartment syndrome: towards an understanding of the interactions between different compartments! Intensive care medicine 2007, 33(11):1869-1872. Malbrain MLNG, De laet I: A new concept: the polycompartment syndrome – Part 2. Int J Intensive Care 2009, Spring 2009:19-25. Malbrain MLNG, De laet I: A new concept: the polycompartment syndrome – Part 1. Int J Intensive Care 2008, Autumn 2008:19-24. Rhodes A, Evans LE, Alhazzani W, Levy MM, Antonelli M, Ferrer R, Kumar A, Sevransky JE, Sprung CL, Nunnally ME et al: Surviving Sepsis Campaign: International Guidelines for Management of Sepsis and Septic Shock: 2016. Intensive care medicine 2017, 43(3):304-377. Dellinger RP, Schorr CA, Levy MM: A users' guide to the 2016 Surviving Sepsis Guidelines. Intensive care medicine 2017, 43(3):299-303. Malbrain MLNG, Van Regenmortel N, Himpe D: Meeting report of the first international fluid academy day. Part 2: Results of the survey on the knowledge of hemodynamic monitoring and fluid responsiveness. Fluids 2012, 1(1):15-26. Sakka SG, Reuter DA, Perel A: The transpulmonary thermodilution technique. J Clin Monit Comput 2012, 26(5):347-353. Eichhorn V, Goepfert MS, Eulenburg C, Malbrain ML, Reuter DA: Comparison of values in critically ill patients for global end-diastolic volume and extravascular lung water measured by transcardiopulmonary thermodilution: A metaanalysis of the literature. Med Intensiva 2012. De Vecchis R, Ciccarelli A, Ariano C: Inferior Vena Cava collapsibility and heart failure signs and symptoms: new insights about possible links. Arq Bras Cardiol 2012, 98(6):544-552. Michard F, Alaya S, Medkour F: Monitoring right-to-left intracardiac shunt in acute respiratory distress syndrome. Crit Care Med 2004, 32(1):308-309. Hofkens PJ, Verrijcken A, Merveille K, Neirynck S, Van Regenmortel N, De Laet I, Schoonheydt K, Dits H, Bein B, Huber W et al: Common pitfalls and tips and tricks to get the most out of your transpulmonary thermodilution device: results of a survey and state-of-the-art review. Anaesthesiol Intensive Ther 2015, 47(2):89-116. Cordemans C, De Laet I, Van Regenmortel N, Schoonheydt K, Dits H, Martin G, Huber W, Malbrain ML: Aiming for a negative fluid balance in patients with acute lung injury and increased intra-abdominal pressure: a pilot study looking at the effects of PAL-treatment. Ann Intensive Care 2012, 2 Suppl 1:S15. Murphy CV, Schramm GE, Doherty JA, Reichley RM, Gajic O, Afessa B, Micek ST, Kollef MH: The importance of fluid management in acute lung injury secondary to septic shock. Chest 2009, 136(1):102-109. Malbrain ML, De Laet I: AIDS is coming to your ICU: be prepared for acute bowel injury and acute intestinal distress syndrome. Intensive care medicine 2008, 34(9):1565-1569. Malbrain ML, Van Regenmortel N, Owczuk R: The debate on fluid management and haemodynamic monitoring continues: between Scylla and Charybdis, or faith and evidence. Anaesthesiol Intensive Ther 2014, 46(5):313-318. 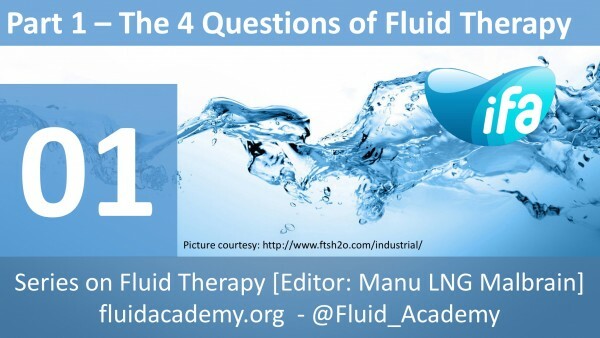 Malbrain ML, Van Regenmortel N, Owczuk R: It is time to consider the four D's of fluid management. Anaesthesiol Intensive Ther 2015, 47 Spec No:1-5.